I have a large Word 2007 document (a book) which contains around 20 images. All the images are currently in the word document, but I also have them stored separately as high resolution png files. I am attempting to create a pdf version of the book by printing to "Adobe pdf". Unfortunately when I check the pdf file I keep finding that the images within the pdf have insufficient resolution. I know that word can be set to deliberately shrink images when it saves a file to disk. I have attempted to deselect this option - but I may have made a mistake. 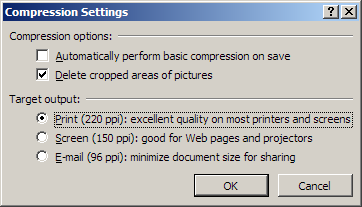 This dialog implies that there are only three possible ppi settings when printing with a maximum of 220. There is a minimum requirement of 300 set by my publisher (print on demand). EDIT: As an experiment, I have tried right clicking on one of the existing images and then selected "Change picture..." and then selected a high res image from disk (2000 pixels wide). I then immediately do a ctrl-C and then paste the clipboard contents into Irfanview (image processing software) only to see that the image is now 406 pixels wide. At a glance this seems to be the width of the image when displayed at 100% within word. If I have word set to view at 20% of full size the resulting pasted images is still 406 pixels wide. I then tried inserting the image afresh in a new part of the document (i.e. the image is not replacing an existing one) - but exactly the same thing happens - a cut and paste into Irfanview still reveals a shrunken image. This is apparently a common problem that you would think Microsoft would have handled by now since people have been complaining about it since at least 2002 from what I found. A lot people suggest changing the file format to WMF or EMF (or any vector format), although I am not sure if that will work for you or not. I normally do not recommend Open Office, but they say that it handles your problem fine, and may be your ultimate solution. Other good links I got from Googling "microsoft word insert image resolution pdf" (without the quotes). Not the answer you're looking for? Browse other questions tagged windows-xp pdf microsoft-word-2007 print-to-pdf or ask your own question. Free PDF printers produce ugly images? How do I get Word 2007 to stop adding an extra 0 to the end of a line when I save as a PDF? How to fix missing equations in Word 2007 when printing/converting to PDF? How can I save/export pdf from word with same png resolution?